Sleeps 16. 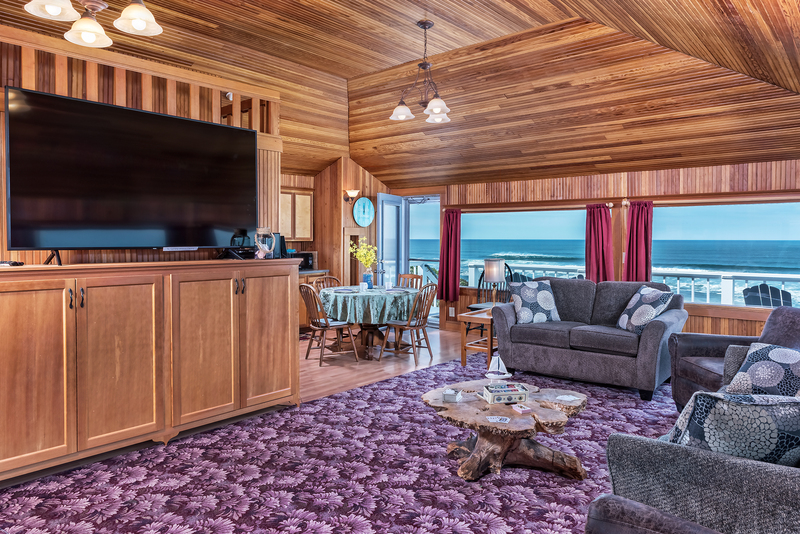 Large Lodge Style Oceanfront Home in Lincoln City has 2 Big Oceanfront living rooms with 75" High Def big screen & foosball. Even a Small unattached Cigar Cottage ! Only 3 stairs from parking to enter the main living area. 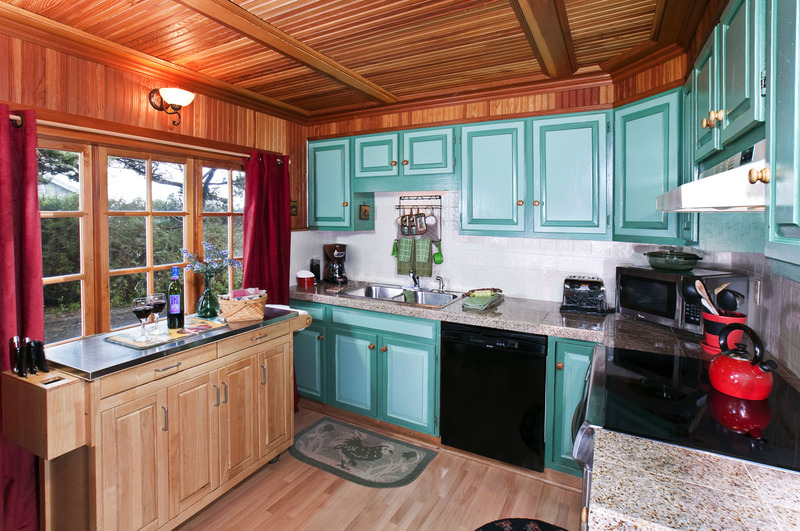 Besides the kitchen the upper family room has a kitchenette and dining table for playing games & puzzles or enjoying early morning coffee and watching the colorful clouds over the ocean. 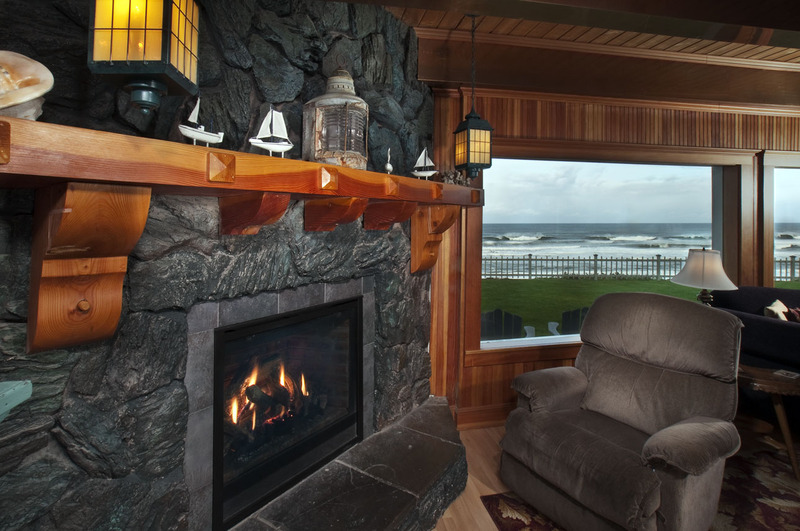 Large stone mantel with gas fireplace and wall to wall windows overlooking the beach. 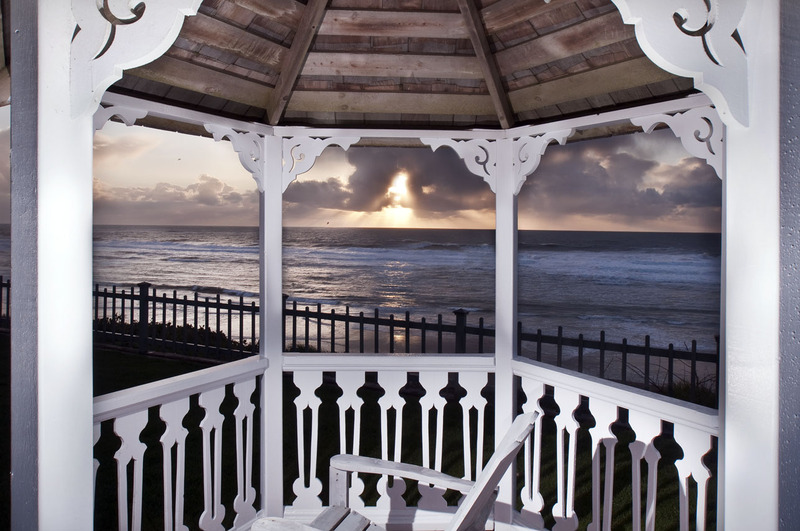 Gaze at the Sunsets, moonlight over the ocean and storms rolling in! Colorful kites are always in view from inside the house & from the large picket fenced yard and brick patio overlooking the surf .This home has a big double lot with rare oceanfront grass yard (perfect for croquet tournaments or a BBQ). It has a Gazebo and several wooden Adirondack chairs for outdoor lounging. There is 1 King bed, 5 Queens beds, 4 twins. 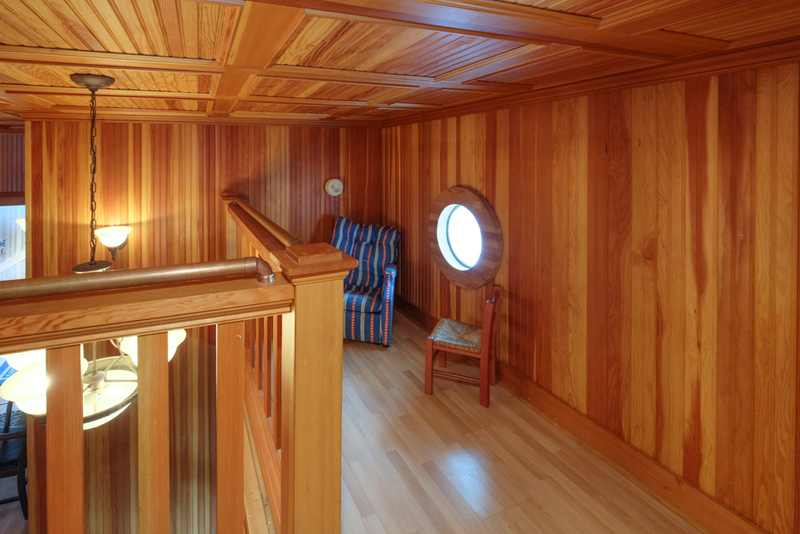 Two of the bedrooms and a bath are on the main entry floor. The kitchen is nicely stocked with just about everything you'll need to create a masterpiece for the gang! 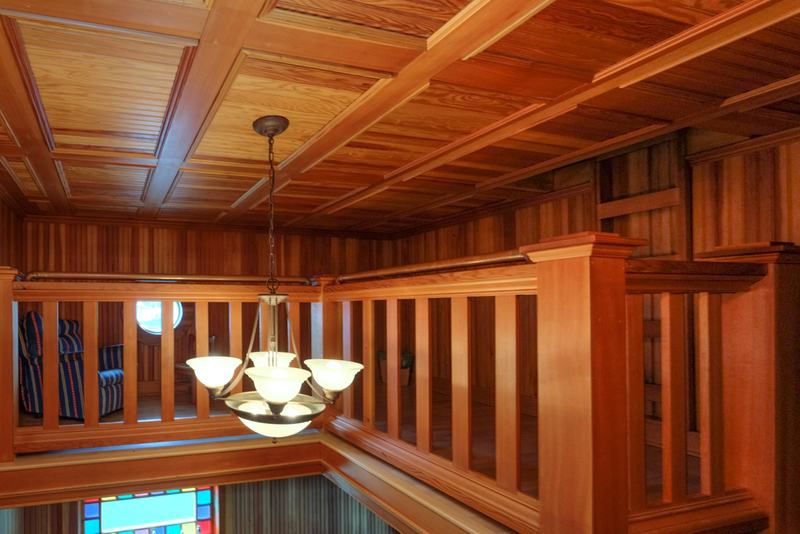 Kids love the magic of the secret attic and window box seats for games or reading. Beach access is approx 5 houses to the North (D River Wayside). Please, No weddings or rental furniture. There are plenty of chairs for 16 guests. Please Avoid Leaving a "Single Night Gap" May - Sept. & Spring Break. Summer 2019 is a 5 night minimum unless filling in a gap. "Went very well until I missed a step, fell and tore my quad. Nearing recovery now 3 1/2 months later." "Our family enjoyed this large comfortable house right on the coast with a great view. Its middle of town location made it easy to get to restaurants, the factory stores, the casino, parks, and to points south like Depoe Bay and Newport. It is high up giving a great view of whales going by. We had to walk a short distance to get access to the beach, but it was a easy walk. 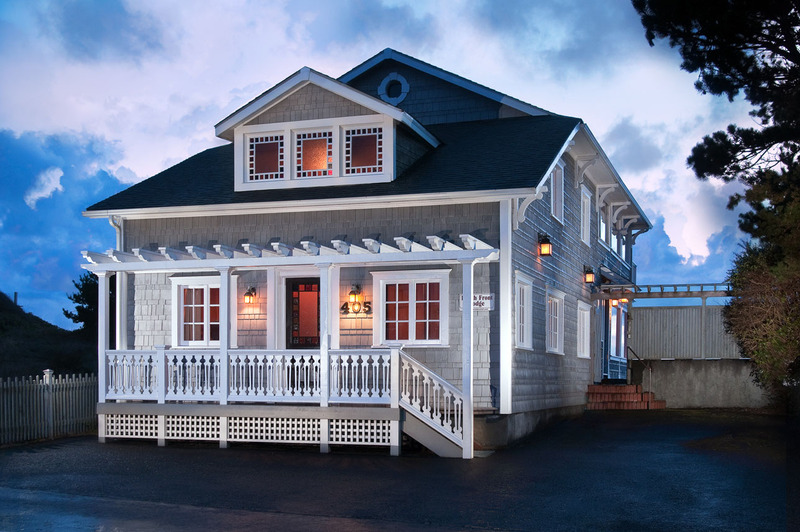 We had no problems with the house, and A-1 Beach Rentals has always been great to work with. " "Very happy with the property (very clean, very nice) and location. Plenty of room for everyone (sleeping arrangements) and nice large living room for Christmas. Certainly enjoyed our stay!" "This was the second time we have rented this house. 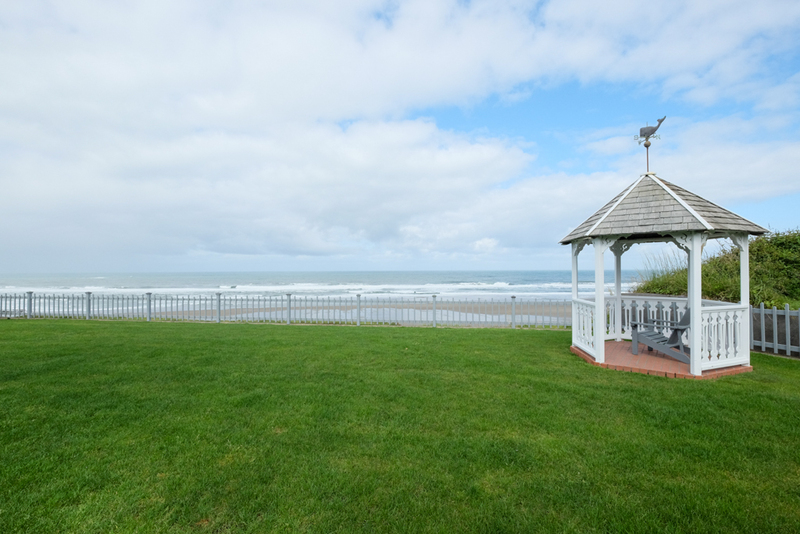 Great for large family gatherings"
"The location is perfect ... middle of Lincoln City. The home is fabulous. Best place we ever have stayed. 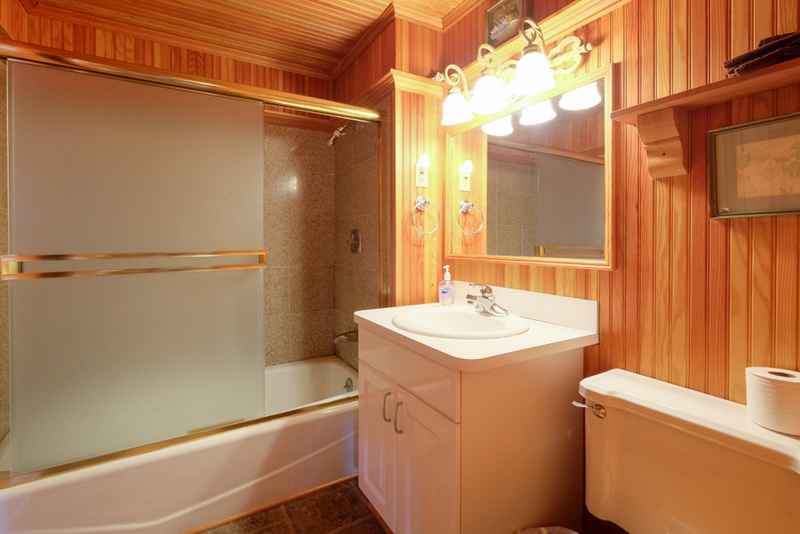 The property is spotlessly clean and well maintained. We had a smoke alarm battery alert go off and the management was at the door in 10 minutes. 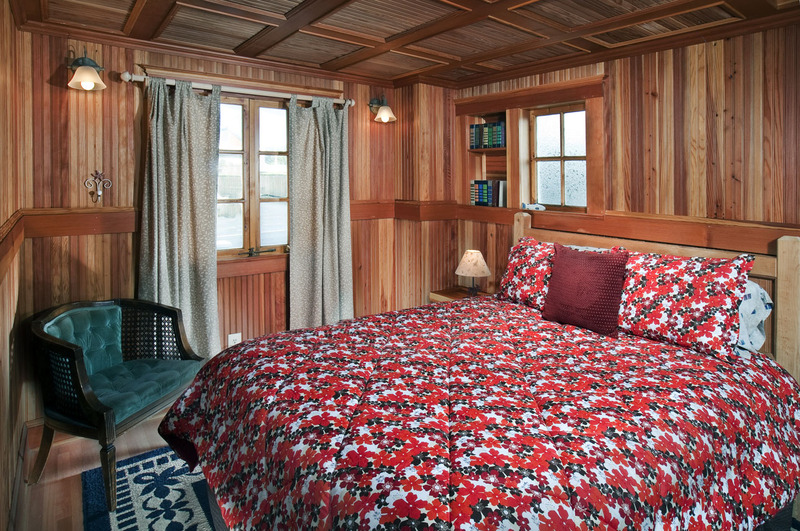 Beautiful views and the rooms are cozy and fun. "Challenging after the number of bedrooms was changed from 7 to 5. Only worked for us because 2 spouses could not join us. Sorry we won't be able to stay here again." "The view was perfect. Front row on the beach. Lots of bedrooms and a nice big living room for all to gather. The place was clean and we had zero problems. The only thing that could have been better was the internet. If several people were on at the same time it slowed down. I would enjoy renting this house again." Manager Response: Happy to have you stay again! "We had a great time celebrating our neighbors 80th birthday in this amazing lodge!" Manager Response: Happy that you had a great stay at Beach Front Lodge! Hope to see you again soon! 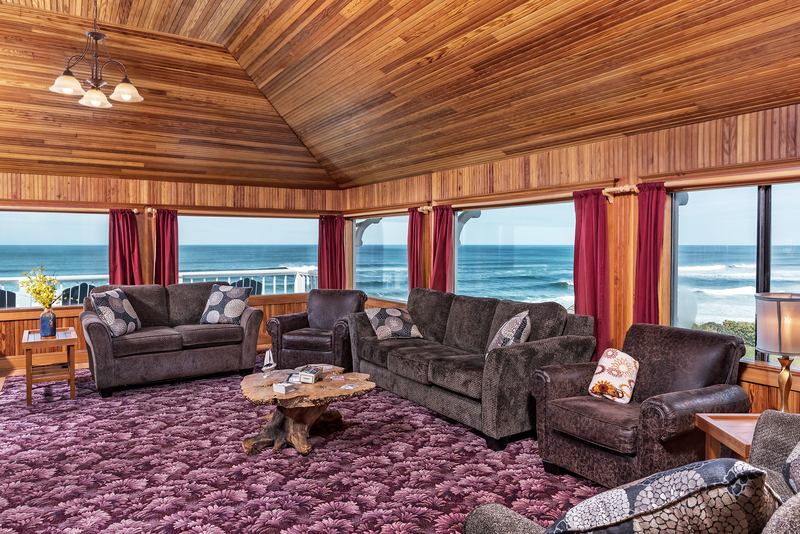 "I've said it all before -- the Beach Front Lodge and Loft is the perfect place for six best-selling romance writers to gather for a week of writing and eating and brainstorming. Plentiful space to get away from each other for a day's work on the next book, a small but efficient kitchen to make meals and a large, relaxing common room for games or just sitting and catching up. 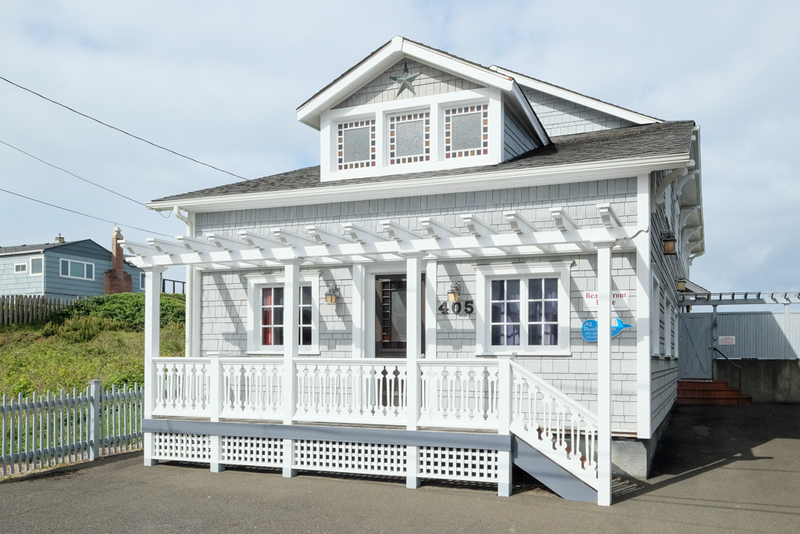 The beds are very comfortable, the view to the ocean is spectacular and the lodge is an easy walk to a grocery store AND the Lincoln City Outlet mall. Kudos to A-1 for their excellent customer service and technical assistance! It's so perfect, in fact, that we reserved the place for next year the night before we left!" "Terrific, centrally located home with plenty of room for us. We saw whales in the ocean, right from the backyard! The walks to the beach were easy to do, and tidepools are 10 minutes away by foot. " Manager Response: So glad you enjoyed Beach Front Lodge! Come visit again soon! "Every year several of us retired nurses get together at the Beach Front Lodge for a reunion. The house is perfect for us-good parking since people are arriving from different areas. Great view of the ocean." "7 of my ladies friends and I had a great weekend. The house was was clean and the beds comfortable. We had a great view and saw 2 beautiful sunsets." "We always have a good time. I felt the house needed some general up keep. The upstairs toilet had to be flushed twice to flush paper. The tub in the loft very slow to drain. The tv color poor and as usual we had to have maintenance out to get it working. They respond very quickly when called. Our group routinely comes here and plan to continue to do so." "The house is beautiful, even more so than the pictures on the website. We did have 16 people in the house and it was cozy quarters but still comfortable. We saw several whales from the living room window and yard!! The only thing that would have made it better is to have access to the beach from the house itself instead of having to walk a couple blocks to it. Would absolutely stay here again. Thank you for the good times! " Manager Response: So glad you had a great stay and saw the whales! Hope you visit again soon! "We had a great time as always. This home accommodates our group well. The drawback is the heating system. You either freeze or bake, depending in which room you are in. There could also be better lighting. The location and view are unbeatable." "We had a great time and we are going to reserve the place for next year. We did have some suggestion which have already been passed on to the owners. Wonderful place"
Manager Response: Happy that you enjoyed your stay at Beach Front Lodge! See you next time! "We had a great time in this house. Loved the grassy area for the kids to play. The living area fit all 13 of us. The only issue was that the kitchen was a little small otherwise we thought it was perfect." Manager Response: So glad you enjoyed Beach Front Lodge and Loft! Come back again soon! "16 of us were very comfortable in this house. 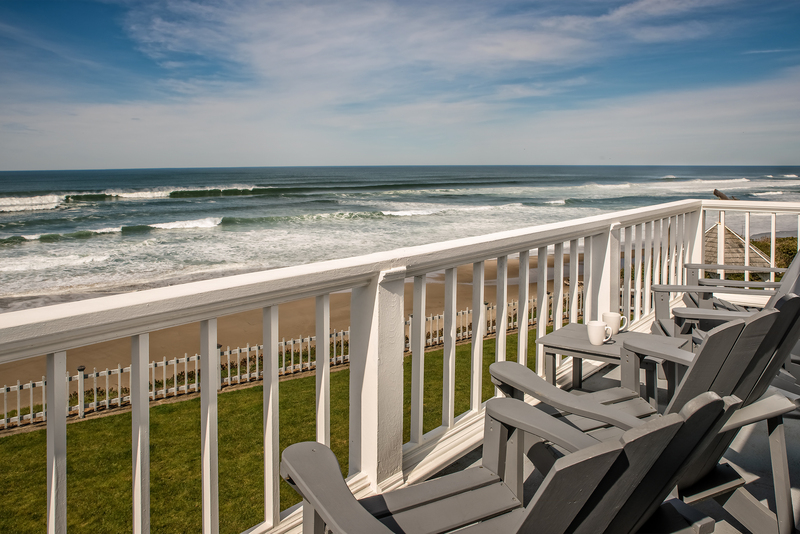 Great access to the beach and great views from the house. Really like the grass area for the kids to run around." Manager Response: Happy you had a great stay at Beach Front Lodge! Please visit again soon! "This was our second time staying in the Beach Front Lodge and Loft. We hosted our third annual Ladies Weekend and it couldn't have been any better! The A1 Beach Rental staff have great customer service, the home owner is amazing and the house is absolutely gorgeous (and of course clean). I highly recommend staying at this property!" Manager Response: So glad that you enjoyed Beach Front Lodge! Please visit again soon! 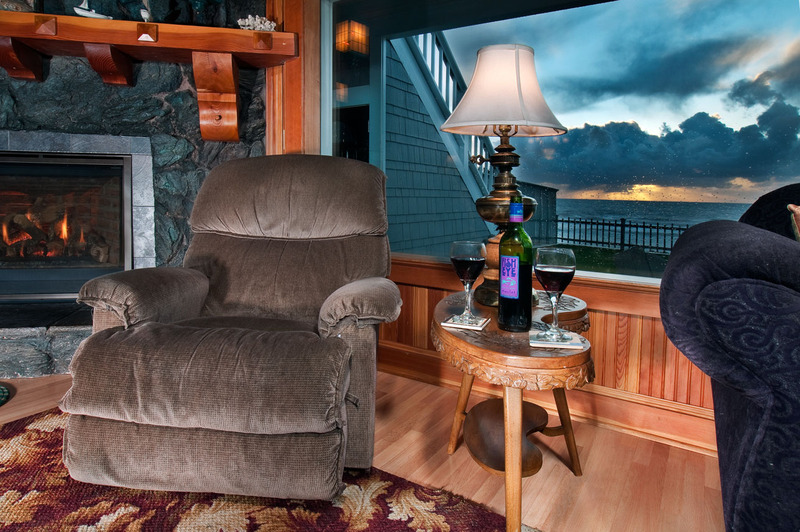 "Best vacation rental in Lincoln City. Enough room to have the whole family stay together. Living room has incredible views of the ocean and enough seating for everyone. " Manager Response: Pleased that you enjoyed your stay at Beach Front Lodge! Please visit again soon! Manager Response: Thanks for staying! See you again soon! "This was the best house, location and just all around wonderful house! Manager Response: So glad you enjoyed Beach Front Loft! Come again soon! What a great house, what a great view. My family comes back year after year." Manager Response: So happy you enjoyed the whales! Thanks for staying again! Hope to see you soon! "We have stayed here several times and always have a good time. The only real problem is that we have trouble getting the tv to work. There needs to be better directions as to its use or a simpler system. Previous times, emplyees had to come start the tv and this time, we just gave up and played cards instead." "Great time. Access to beach and access to town made for the perfect location. Loved the home." Manager Response: Glad that you had a good reunion! Hope to see you again soon! "We had a great time. The house is beautiful. It was very clean and well supplied. There was plenty of space for our family without feeling cramped. The view was amazing! Beach access was only about a half a block so it was nice amd close. The only thing I would say would be heat in the bedrooms. They are on hour timers so everyone got cold at night, a couple people ended up buying heaters. Otherwise, it was a great experience and I would definitely stay there again." "We were there to celebrate our Dad's 90th birthday and the place was perfect. We had 13 adults and we couldn't have picked a better place." Manager Response: Thanks for staying at Beach Front Lodge! Come visit again soon! Manager Response: Thanks for Staying! Come again soon! "Spacious home, lots of comfy touches; extra pillows throw blankets etc. well stocked kitchen. Family of 15 and we had plenty of space and enjoyed the huge living room in the evenings. Stunning view! Epic yard! Will be back"
Manager Response: Pleased that you enjoyed your stay at Beach Front Lodge! Come visit again soon! "Really enjoyed this house. Very comfortable, clean and well stocked. " Manager Response: Pleased that you enjoyed your stay at Beach Front Lodge! Visit again soon! "The Beach Front Lodge and Loft gets an A+ from all 9 of us that stay at this property year after year!!! What we like the most is the view, more than enough seating in the living room, fully equipped kitchen, nice bedrooms, tons of things to do nearby. Extremely clean. I could go on and on. " Manager Response: You guys are great! Thanks for staying every year! Come back again! "This is a beautiful house, with plenty of space. It was clean and well maintained. My only complaint is that the DVD is impossible to operate - very confusing! Never could get it to work." "We had a great time. The only problem was the discrepancy between our emailed instructions and the handwritten instructions on the refrigerator. Otherwise everything went well. Great place. " "Seven grade school friends who gather at the beach for a 4 night stay for shopping at the outlet mall, and time to reconnect. " Manager Response: Glad you enjoyed your stay! Please come again! "What a perfect place for six writers to retreat, relax and write! So perfect that the day we returned home, we booked next year's retreat! Plenty of room for working quietly on our own and for gathering in the living room to brainstorm new books, and around the large dining room table to share meals we prepared in the small but well-appointed kitchen. When the view of pounding surf and soaring gulls weren't close enough from the cliff-side lodge, then we could take an easy five minute walk and wriggle our toes in the sand at D-River State Park. When the TV in loft got confused and wouldn't work, A-1 sent a technician over within two hours and we were back in business. Great response! We couldn't have asked for a better retreat! Manager Response: So glad we were able to help you in a speedy manner. So glad to have you and hope come again soon! "Our 2nd time at this house, we love it!" 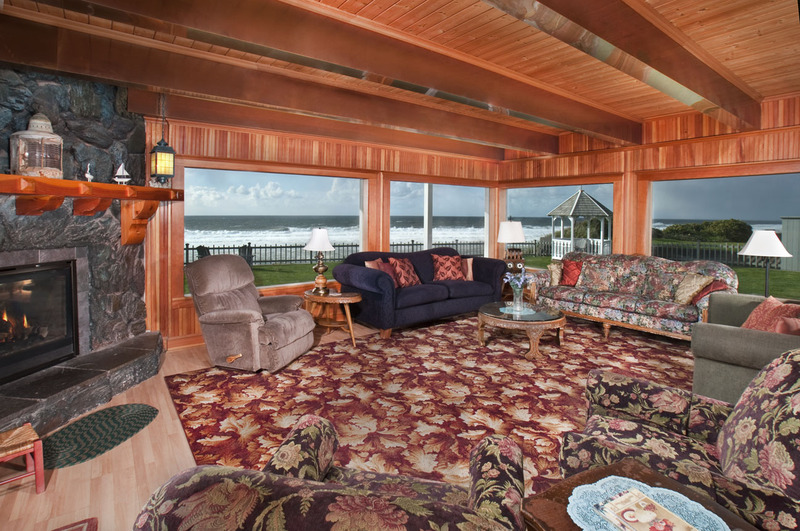 "This home was perfect for our large group, with two sitting rooms and views of the whales every night. We loved that we could walk to town for coffe or just to wander the shops. The app provided by A-1 was extremely helpful for planning local activities. We would definitely stay again." 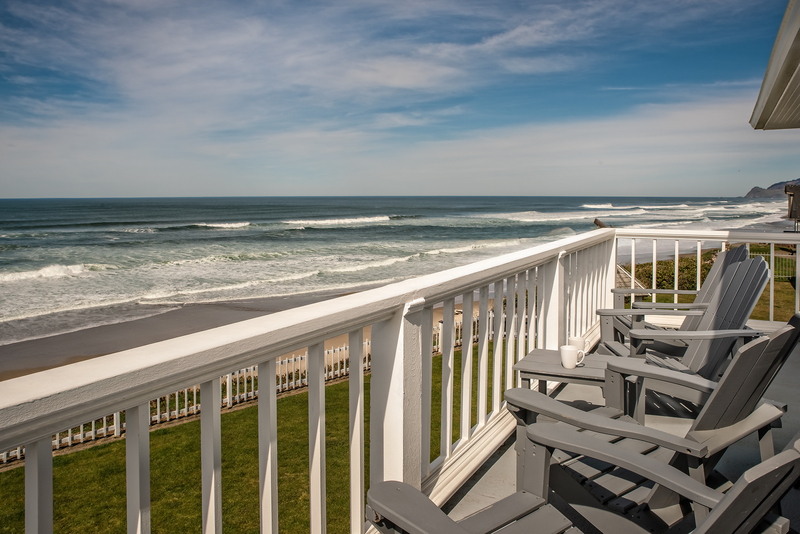 Manager Response: Very glad you enjoyed your time at Beach Front Lodge and Loft! Please come and visit again soon! "Everything about this place is top notch. Love it. " Manager Response: Thanks! Please come again soon! "The house and view were beautiful. Had a wonderful time. The only complaint is that the beds weren't very comfortable but everything else more than made up for that. 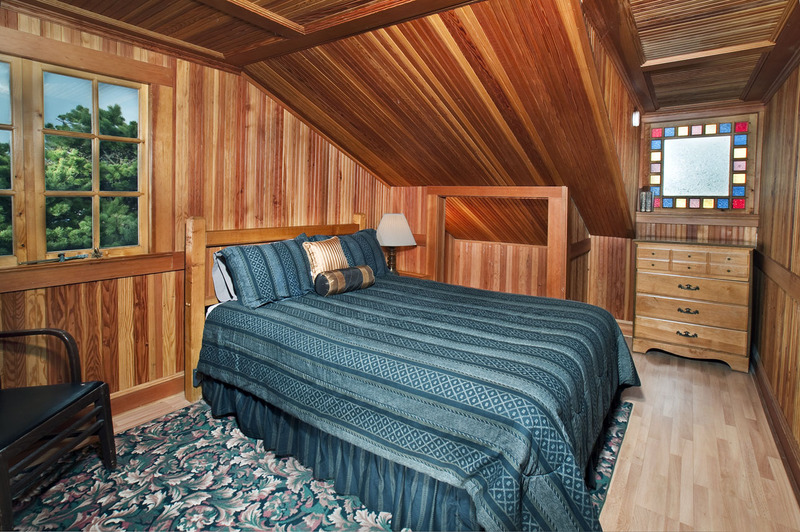 Who has time to sleep whe you are on the Oregon coast. I would definitely book this house again!" "5th summer at this spot for family reunion. Better than ever!! Except for the stove we all curse. It has become an important part of our annual event. We will be back next summer. Sleeps 15 of us easily. Close to beach access. " Manager Response: Really glad you enjoyed your time at Beach Front Lodge! Please come again soon! "We had such a great time in Lincoln City! The beautiful house is located on the beach with a beautiful view. Great views and great location! " Manager Response: So glad you enjoyed your time at the beach! Visit again soon! "This home was large enough for 16 people over the weekend...12 adults, 4 kids. The kitchen was the most well-equipped of any rental ever, with pots, pans, utensils for cooking for a crowd, which we always do. (almost everyone in our family is either a cook or a sous chef). The living room was large enough to set up the card table for games, so that everyone was comfortable. We really appreciated the large room upstairs, though, for family members that needed to get away from the rest of us. 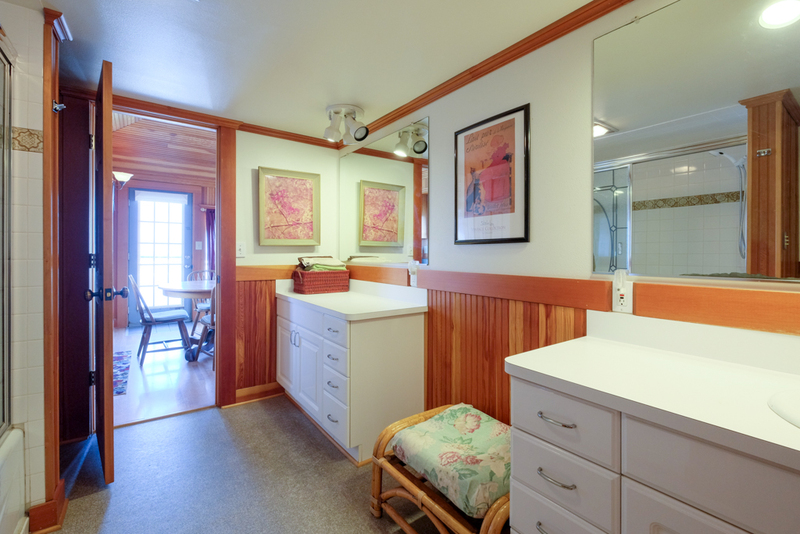 That room, with its own bathroom and small kitchenette was an added bonus. While the weather was too cold for us to enjoy the gazebo and lawn area, I would love to come back in warmer weather. We had one issue with a maintenance problem and the owners were there quickly to solve this, even on a Sunday. Definitely will give this property and A-1 rating.."
Manager Response: So glad we were able to handle that issue in a timely manner. Thanks for your review! Please visit us again soon! "Spectacular location and house! A-1 was great to work with and the house was clean and had so much to offer. We will return again." Manager Response: So glad you enjoyed Beach Front Lodge! Please visit again soon! "We thoroughly enjoyed our stay at this rental. The rental was very much as described by the owners and was above our expectations in most categories. We loved the location and the ocean view. Our entire family was more than satisfied with every aspect of the rental. I would highly recommend this rental to anyone who is considering it. " Manager Response: So glad you enjoyed your time at Beach Front Lodge! Please visit again soon! "Always a wonderful place to come back year after year. The view can't be beat." Manager Response: Thanks! Glad you enjoyed your visit! Please come again soon! "It was incredible. The rental was easily accessible, exceptionally clean, and tastefully furnished. Books, games, puzzles,etc., were provided for those rainy days. I heard about the rental from a colleague. The owners were "Johnny-on-Spot when I couldn't read the buttons on the dishwasher! I recommend it heartily and would return in a heartbeat. Thank you !" Manager Response: Really glad we were able to fix that for you! Please visit again soon! "We really enjoyed our stay, there were lots of bedrooms, the house was really clean and the kitchen very well stocked. The things we enjoyed most was the large living room with lots of seating with huge windows looking out to the ocean, we did lots of whale watching and couldn't believe how many whales we saw. The outdoor area is great, plenty of outdoor seating and the location of the property is walking distance to beach access, lots of shops and great restaurants. It is one street off the main road through town so it was also quiet, we had an unobstructed view of the ocean. We didn't do any cooking at the property but if we had, the kitchen had everything. If ever in town again, I would certainly choose this house, we were a party of 7, 3 couples, one single, we all had our own rooms and there were still plenty of bedrooms, this house would be the place to bring a large family or group." Manager Response: Thanks for your kind review! So glad you enjoyed the whales! Please come again soon! "This is the second year that our group of six NYT and USA Today bestselling authors have stayed at the Beach Front Lodge and Loft -- and we've already reserved another week for 2018. 7 bedrooms gives each of us our own private space for writing, the 3 bathrooms are more than adequate, and the gathering places around the dining table and in the huge living room allows for great meals together, board games, brainstorming and plenty of relaxation. 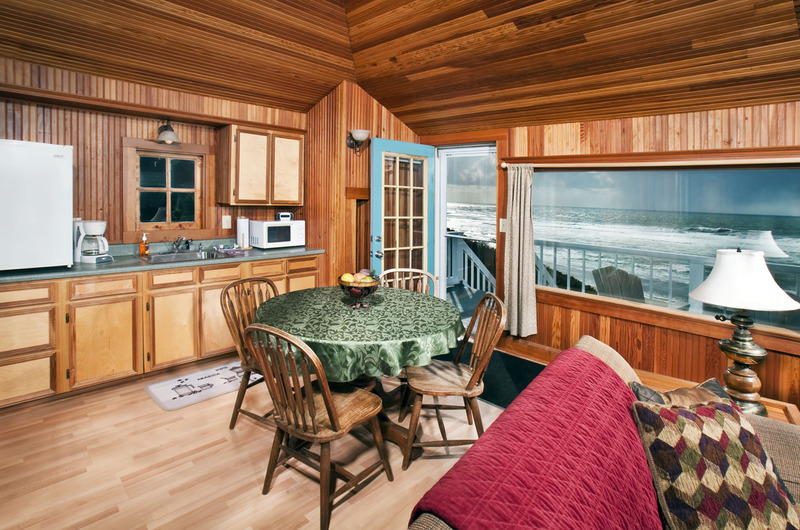 The well stocked kitchen and comfy beds make the lodge super comfortable, and those huge windows on the dramatic Pacific ocean can be distracting, but in the best kind of way. Just outside the back door is a huge lawn and even a separate building for getting away from it all. It's a few blocks from the Outlet Mall and a great local grocery store. Great walking and kite-flying. All in all a fabulous place for retreats, reunions, and relaxation. " Manager Response: So glad that Beach Front Lodge works well for your retreat! Looking forward to seeing you again next year! "Everything was above our expectations." Manager Response: Thanks! Please visit again soon! "Other than a couple of minor issues (leaking faucet in upstairs bath room and loose faucet in the kitchen and didn't report but the soap container in the dishwasher is near to impossible to close), we loved our stay. This was the 2nd year I've rented this property. I like the fact everybody has a private room in which to sleep (there were 8 of us and only 2 couples), I love the view, watching the whales and access to the beach. All in all, we had a spectacular stay." Beach Front Lodge and Loft. We especially loved having the lawn (used it for croquet and lasso golf) as well as the ocean for activities. It is certainly a place we would return to. We cooked all our meal there and the house had everything we needed. Working with A-1 Beach Rentals was a great experience." Manager Response: Really glad that you enjoyed your time at Beach Front Lodge! Please come again soon! 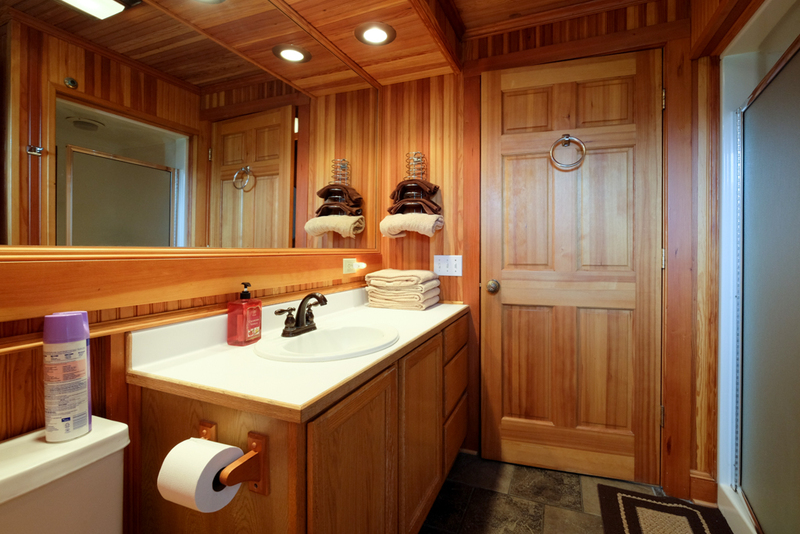 "Home was well equipped, warm and comfortable. Would highly recommend it!" Manager Response: So glad you enjoyed Beach Front Lodge! Please come visit again soon! "This property is a great place for a large group or family. We rent it every year for a ladies get-a-way weekend. We love it because the view is excellent and we always enjoy the stay no matter the weather. We had a little problem with the key to the gate. The house key & gate key were not mark and we mixed them up. Putting the house key in the gate lockbox, upon returning to the house we couldn't get in the gate. That problem was solved pretty fast." "Very nice home, great location, well stocked kitchen, and well maintained. Everyone enjoyed it and would come back to this property. Comfortable beds. Only suggestion is to provide shower soap and more than one roll of t.p. per bathroom." "A quiet,relaxing, wonderful place to stay for our Women's retreat. The house was comfortable, had a great view, was clean and well maintained. " 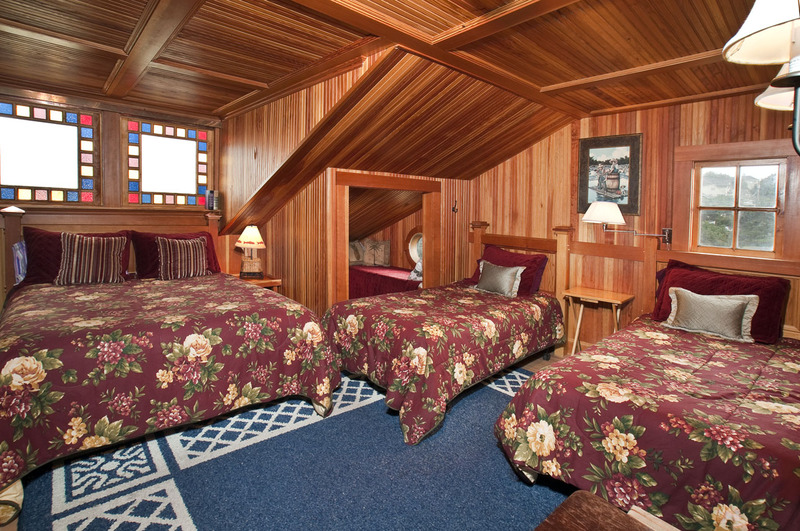 "We have stayed here several times and always like it. The kitchen well stocked, great view and close to town." Manager Response: So glad that you enjoyed your time at Beach Front Lodge! Looking forward to seeing you again soon! "Friends meet here for a weekend getaway and the location and house size were perfect. House pictures of inside kitchen and dining room were hard to see the amount of real space, the other pictures were better in person." Manager Response: Really happy that you enjoyed your time at Beach Front Lodge! Please come again soon! "Wonderful Our second time here! 7 bedrooms 3 baths enough room for the ladies and a unique castle to stay in. Thank You"
Manager Response: So glad you enjoyed Tide Pools! Please visit again soon! 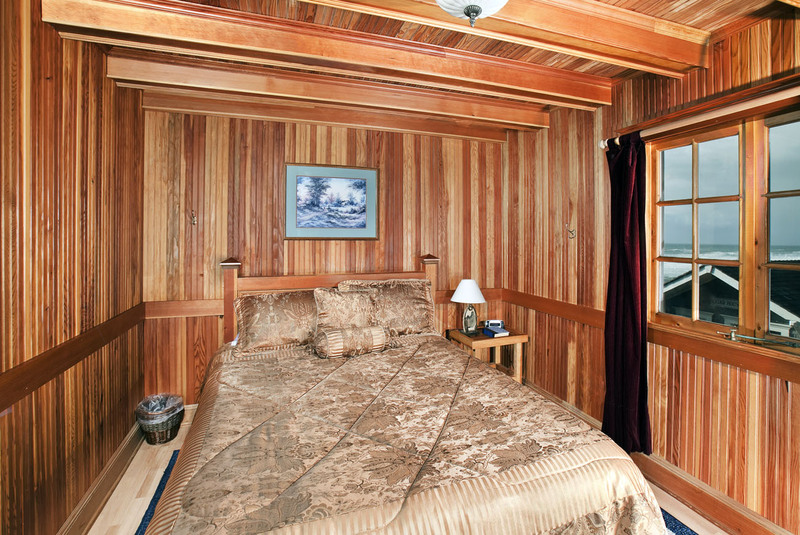 "We had a great time and were very pleased with the accommodations. It was perfect for 5 couples. Very nice and had everything we needed for a wonderful weekend." Manager Response: So glad that you enjoyed Beach Front Lodge and Loft! Hope to see you again soon! "We bring a large group and this Home is just Great . 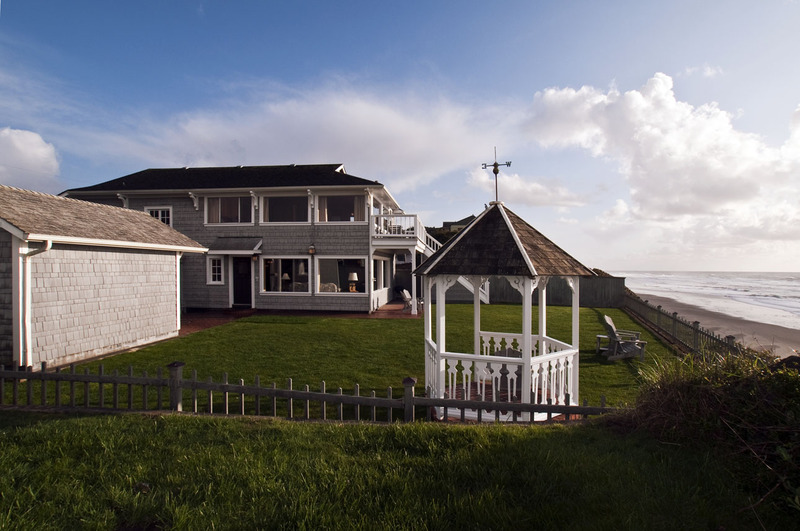 We have been coming to the Oregon coast for many years and this Home is our Favorite. 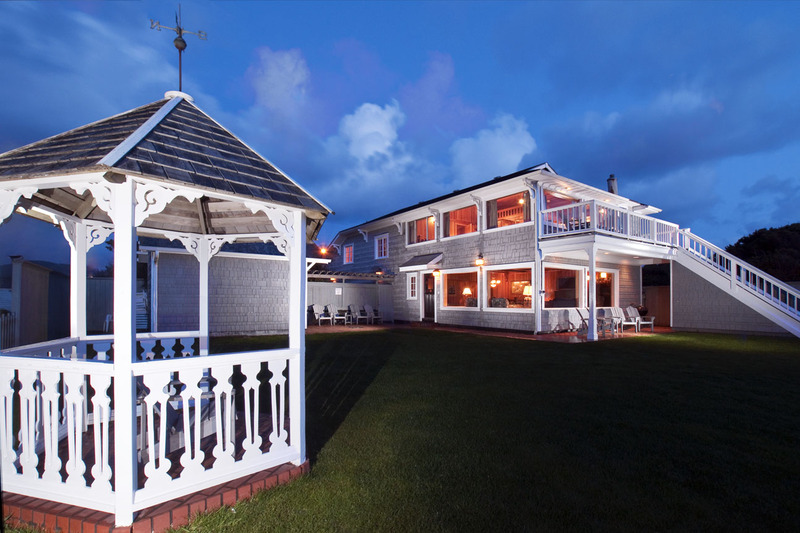 The location is in the heart of the town and the ocean views from the Home our the best . " Manager Response: Glad you enjoyed Beach Front Lodge! We hope to see you again soon! "Such a great house for a large group. Lots of parking too since people coming from different areas so end up with more cars. " Manager Response: So glad you enjoyed your stay!
" My family has had their family reunion here for five years and will again next year! Everyone loves it. Perfect location. Close access for the beach walkers, antique shoppers, gamblers, the outlet is minutes away and there are wonderful restaurants. We also eat in and the kitchen is wonderfully equipped and the living room is big enough for all of us to gather around . When we check in it is absolutely spotless!!! "This was our second stay at the Beach Front Lodge and we loved it as much as the first time! My favorite part was waking up every morning and sitting in the living room with a cup of coffee and the amazing view of the ocean. The owners have done a wonderful job of making sure the house is equipped with everything we needed to make us comfortable and to feel right at home. My only suggestion would be to add and electric griddle in the kitchen. Thank you A1 for providing us with this beautiful home away from home!" Manager Response: Glad you enjoyed your stay! "We had a fairly large group: 12, and we commented on how we had plenty of space, never felt on top of each other (except when we were cooking, but kitchens are never big enough :-) ) We actually thought another part of the family would be there, but they couldn't come, and we still would have had ample space. Loved to view, it was a short walk to the beach. We were already talking about it's a place we'd love to come back. We spent so much time doing other things, we didn't get to enjoy the yard as much as we planned to do: the gazebo and great chairs, just hang out there and read or paint or whatever. "We enjoyed every minute of our vacation spent in this Beautiful Huge Home. It was perfect for the 16 of us. 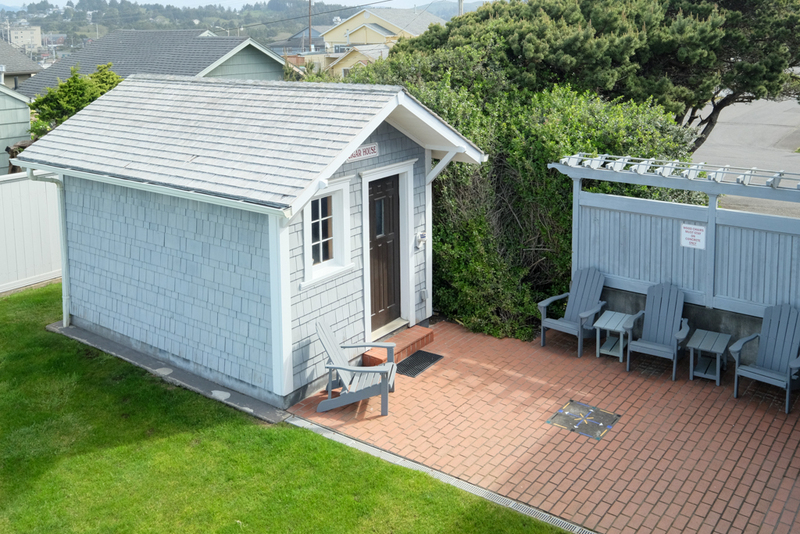 Our Grandkids loved the secret attic and loft areas.The weather was beautiful,and with the large yard,kites and lawn games were very popular,along with The short walk to the beach.The views were spectacular from dawn to gorgeous sunsets. The home was fully equipped with everything we needed.The decor and the history of this house is amazing.The master suite is amazing, and the cigar house was a plus for the smokers. 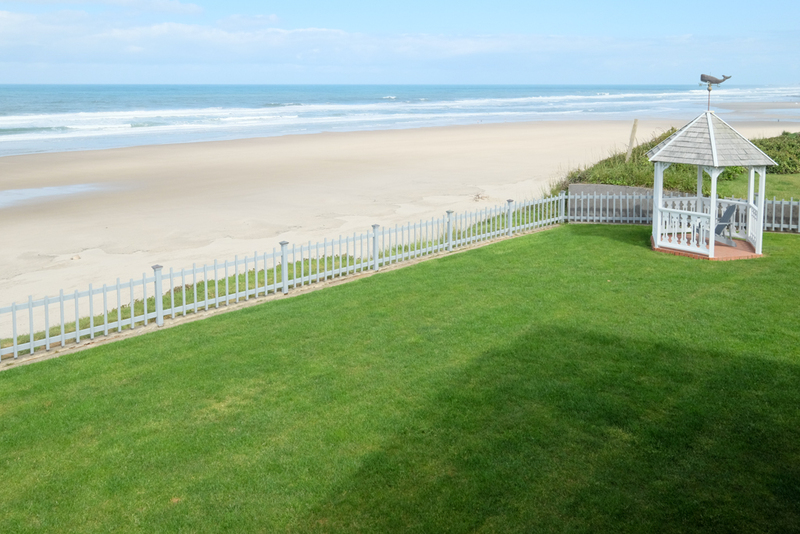 It was perfect for our family, and we recommend This Home and Lincoln City for a Perfect vacation." 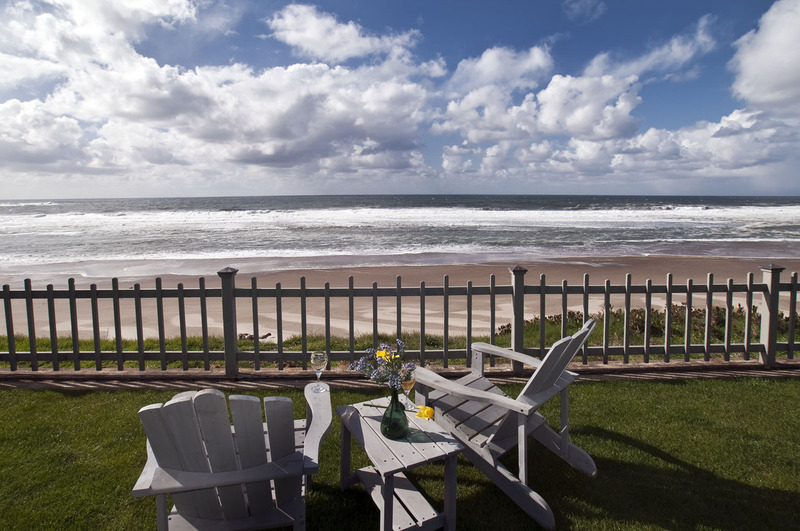 "Six couples away for the weekend to enjoy the Oregon Coast. Your house is perfect for large groups. Our time was wonderful and plenty of sitting area for each of us. The view from the livingroom was wonderful and we could see up the beach for a while. We saw kite surfing and lots of blue sky. " 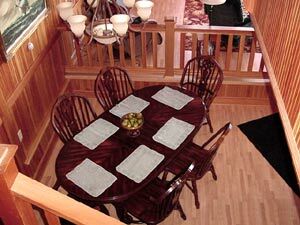 "our group of 10 ladies enjoyed your home - it was comfy perfect front room for our group. The view was amazing. Hope to stay again." "We have rented the Beachfront Lodge for the past several years, it was, as always, a perfect place to celebrate my mother's birthday with the family." " This spectacular house worked perfect for myself and seven other friends and the house was as listed But the photos did not do it justice. It was more beautiful than I had imagined. Rooms were all very comfortable and the views were amazing"
"I title it stay at the ocean versus the beach as you are right there over looking the ocean. The view is truly incredible. Place is nice and clean, I had no issues with allergies. " "Overall our stay at your house was good. We had 9 adults and 5 chilren staying here. The kids had a blast. The adults had fun. The view from the house was spectacular. We loved the yard, but why the rule about not moving the wooden chairs onto the lawn? There was good access to the beach. The house was equipped adequately for what we needed to do. Just a couple of suggestions: The table chairs in the loft are very unstable----one broke from someone merely sitting down on it (not an overweight person). The towels and linens were "Good Will Quality"---we think you need to purchase better towels and linens. How about adding a coffee grinder to the kitchen equipment? " "For about eight years six guys and me, have been renting from a-1 rentals. We keep coming back because of the great and friendly service. This particular place is large, clean, right on the beach and has great location. 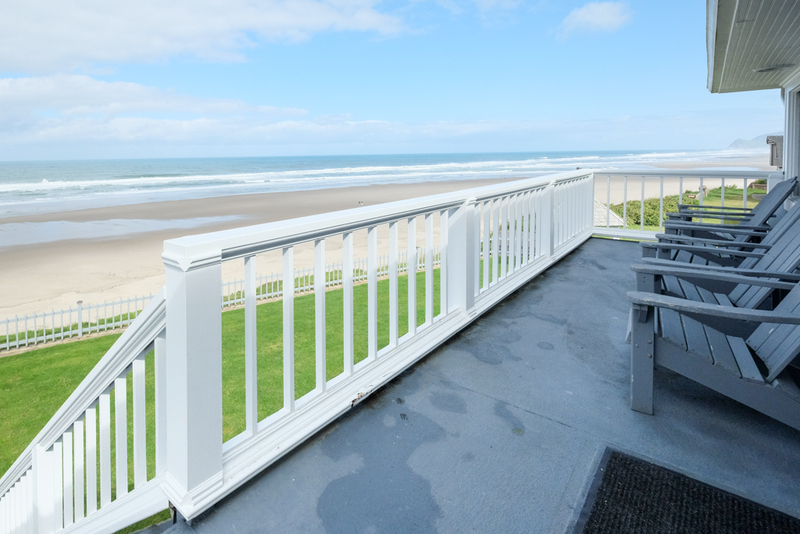 Being located right in the middle of Lincoln city you couldn't ask for more. Thanks. " Adequate bathrooms for 12 people. Very pleased." Manager Response: Thanks so much for visiting! Come back again soon! "This was my 3rd time back to this rental, and had a great time. Location and size of the house is perfect for a large group. The beds though need to be replaced. Everyone commented in the mornings about how uncomfortable the mattresses are. " "Great house right on the beach. " Manager Response: Thanks so much for staying! Please come again! "An awesome home for our annual get together. This house is a house we would rent again. The accommodations were comfortable and we each had our own room. Our only suggestion would be for brighter lighting in the living room. With the shorter, dark days, it would have been nice to have some upward illumination to bounce the light off the ceiling. Warren and his wife were very attentive to helping us out in times (three!) of need. We will book this house again in a heart beat." Manager Response: Thanks for staying with us! Please come back again! "Thought it was just a family reunion-turned into a wedding. Beautiful setting and great home. Would rent again in a heartbeat!" Manager Response: Thanks for staying with us! Visit again soon! "Everything was perfect. We had light bulbs out and got a call 5 mins. later to get it fixed. We opted not to but it was very nice to have a quick response. The house was very, very clean. I highly recommend this house. " "Once again everything was perfect including the weather. My family had a wonderful time and the place was incredible. We saw whales from the living room on two days. The views are unmatched. Great place for a family get together." "weather was great all three days,just a great get away,we have been there 15 years in a row." Manager Response: So glad you enjoyed your stay! See you again soon! "We had a wonderful time. The house was big enough and had enough bedrooms for our family also enough room for everyone to sit around and talk. The view of the beach was beautiful and beach access was reasonable. We felt that it would be nice to have a fridge that was a little bigger for large groups, and some of the mattresses could be replaced. They were old and not to comfortable. " "Was amazing as soon as we walked in. So much room for all of our guests. We really loved the living room where there was plenty of room for us all to sit around and visit. Kitchen was a little on the small side and they could definitely use some kind of shades on the ocean view windows in the living room as the sun was blinding in the evenings. All in all we were amazed and will return for future retreats!" 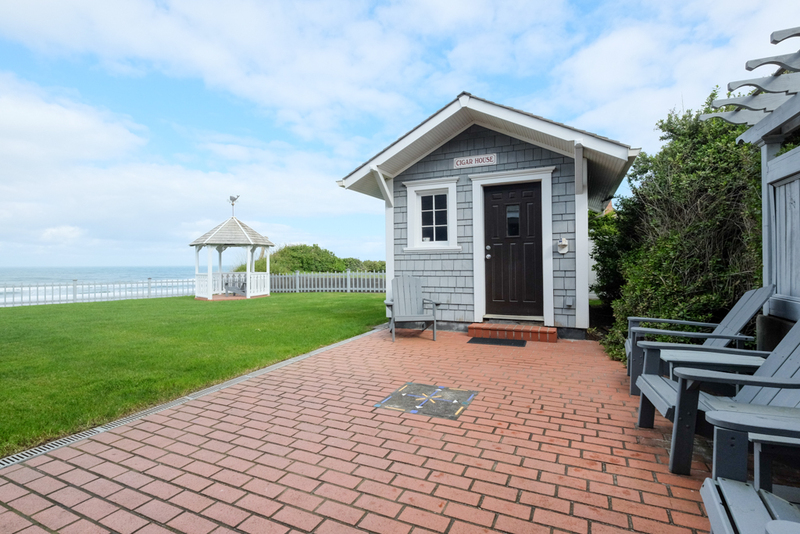 "This great house is right on the water in Lincoln Beach, where you're pretty close to everything. Beach access is about a 3-minute walk away, there are plenty of restaurants and the views are gorgeous. We were a large family gathering, and the decent-sized backyard was a great plus. Really, I have no complaints and only one small issue: The oven is pretty inconsistent. We amade some meals in the smallish kitchen and the oven was a little tough to figure out - temperatures were all over the place. But that's a minor quibble. Loved the place, loved Lincoln City and its surroundings. Highly recommend to any large families looking for a peaceful getaway." "We absolutely loved spending time in this great home right on the ocean and hope to come back very soon! The beds were very comfortable and the 7 bedrooms gave us plenty of space to spread out. The fireplace in the main living room gave off a cozy vibe and relaxation was our key goal. 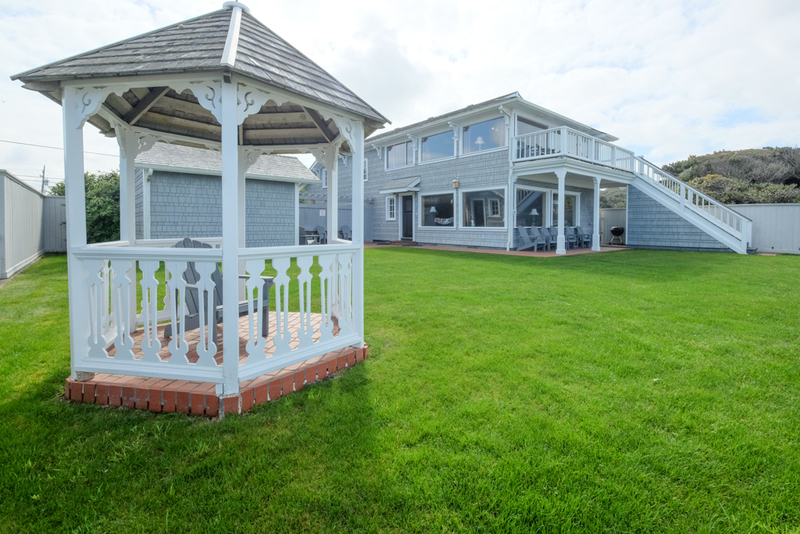 The home is located on a bluff above the ocean, so beach access is just a short walk away. Storm watching was disappointing due to the fabulous weather, but we enjoyed the view from both the living room and the "master bedroom" which we used more as a second family room as there was plenty of room to spread out and play games or do puzzles or just watch tv. " "We had a lovely time. We rented this same house last year and really liked it so we came back this year. There's plenty of room for everyone to have their own room and the yard is great. Access to beach is very easy too. " Manager Response: Thanks for staying with us! Please visit again soon! "We really enjoyed the space and view of the property. The variety of bedrooms was nice and everything was very clean. Would suggest having a coffee grinder." "This is a pretty great place to have a family reunion. The number of bedrooms is perfect for a crowd, and the living room is so spacious that it easily holds everyone for visiting, playing games and enjoying each others' company. 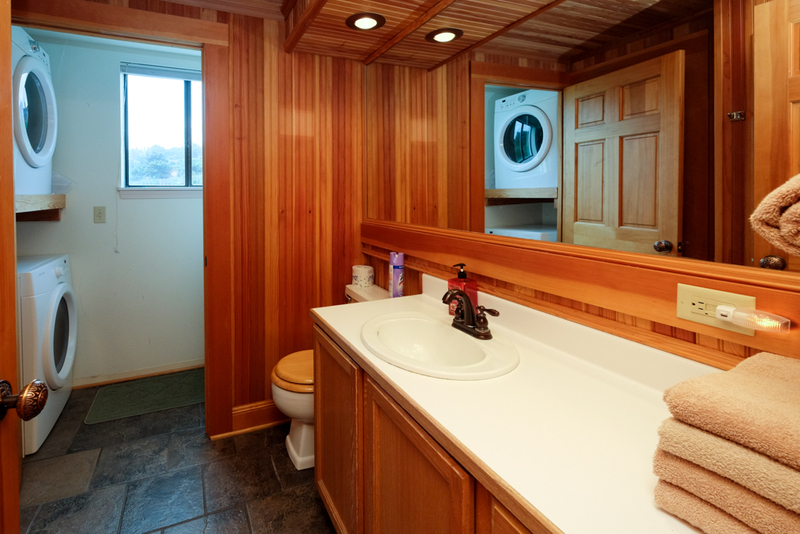 The property was very clean and well maintained. The cleaning staff were just finishing as we arrived, and they were so polite and welcoming. The doors do not lock on two of the bathrooms, which should really be fixed...that causes some anxiety when you're in the shower! We had a difficult time keeping the temperature comfortable - it was often too hot or too cold. Probably just a matter of being there in the winter. Summer visits are probably very comfortable. We will definitely come back!" "My family of 15 enjoyed this house very much. We have a family get-a-way every summer for a few days and this property was delightful. 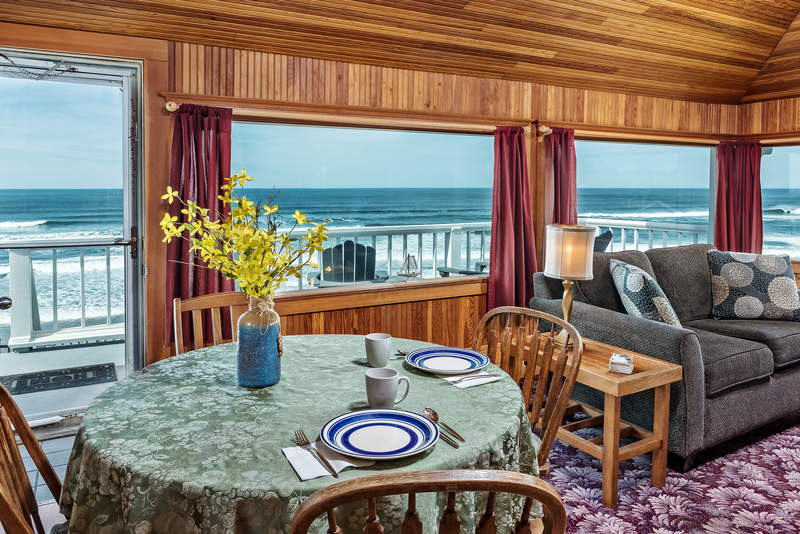 We always us A-1 Beach Rentals and have stayed in wonderful houses in Lincoln City." "Our stay was wonderful as it always is. We have rented the property on five occasions and find it very relaxing each time. We plan on holding our retreat there again next year." "The house was amazing. Beautiful. We had 9 people and there were beds to spare. The house is centrally located in Lincoln City so we walked to restaurants but drove to do glass blowing and other sight seeing. It was a short walk to the beach access and a short drive to hiking trails. The house is situated on a bluff so we could look down on the beach to watch family and other beach goers as well as watch the ocean and whales spouting offshore. Our experience was great. " Manager Response: Thanks for visiting! So glad you enjoyed the whales! Come again soon! "We have been staying here for several years and love it. I recommended it to a friend and he stays there 2-3 times a year." "A group of us, 8 gals really enjoyed out time in this rental home. 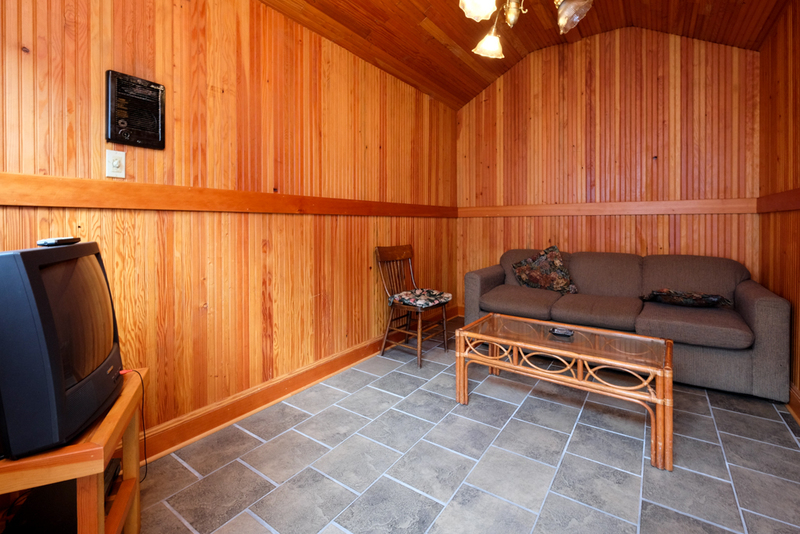 The wood details and the open front-room area, makes conversations open to all. Sitting outside overlooking the beach is a great view!" Manager Response: So glad you enjoyed your stay! Please come again! "Great house! We had some problems with the stove not boiling water. That is all"
"We are a group of older ladies that have been going to the beach twice a year for many years. We always have a great time and have found that Beach Front Lodge and Loft meet our needs. 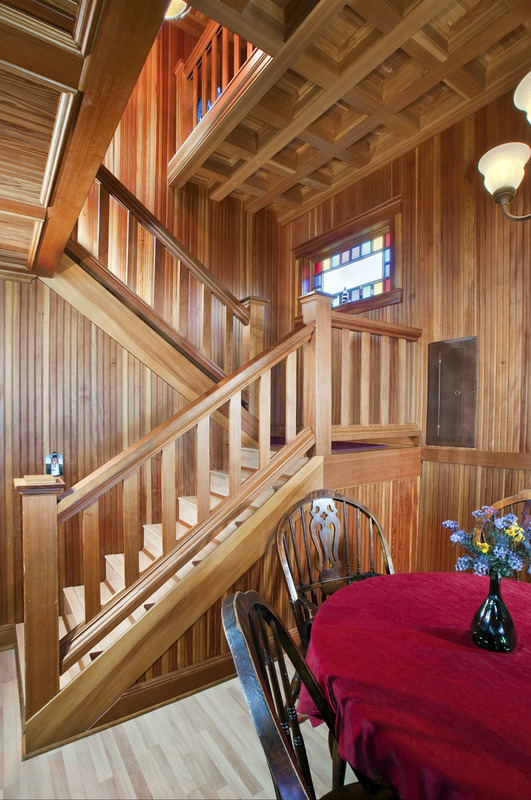 Some of our ladies have trouble with stairs and we still have a view and some bedrooms on the main floor." Manager Response: So glad you visited again this year! Please come again very soon! "Plenty of room for the extended family. The home was nice, well appointed and clean. Beach access is a short walk." Manager Response: Really glad you enjoyed your stay! Please come again!